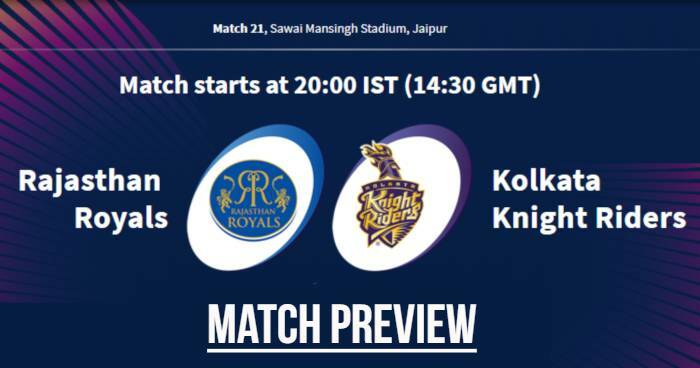 Rajasthan Royals (RR) and Kolkata Knight Riders (KKR) will play the 21st match of Indian Premier League - IPL 2019 at Sawai Mansingh Stadium, Jaipur on 7 April 2019. As far as weather is concerned, it will be a warm day with the temperature around 35°C during match hours. Rajasthan Royals are 7th on the points table with 2 points in 4 matches; winning one match after 3 consecutive loss. 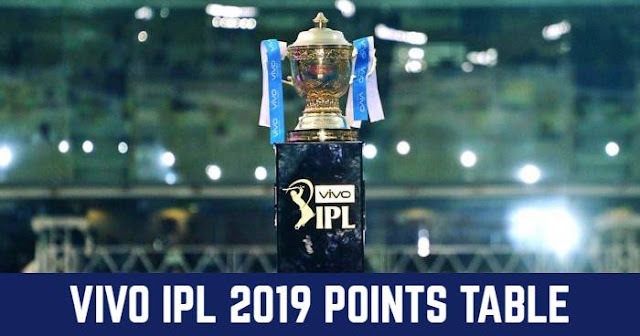 On the other hand, Kolkata Knight Riders are 3rd on the points table winning 3 matches of the 4 matches. Rajasthan Royals would bring Sanju Samson back into playing XI in place of Stuart Binny. Kolkata Knight Riders are having great momentum and would like to play with same playing XI. olkata Knight Riders (KKR) and Rajasthan Royals (RR) have played 18 matches against each other in Indian Premier League (IPL) and the other one match abandoned due to rain. Out of 18 matches, Rajasthan Royals have won 9 matches and remaining 9 matches was won by Kolkata Knight Riders. Interestingly, twice the match between KKR and RR was ended in super over; both times Rajasthan Royals clinched it. Once in super over also they ended in a tie, but Rajasthan Royals won it by the boundary count. In last season (IPL 2018), Kolkata Knight Riders and Rajasthan Royals have played thrice against each other and Kolkata Knight Riders won all the three matches including one in Eliminator. Rajasthan Royals and Kolkata Knight Riders have met 5 times at Sawai Mansingh Stadium, Jaipur out of which Rajasthan Royals won 3 matches and Kolkata Knight Riders won 2 matches. Buttler has scored half-centuries in his last four IPL matches at the Sawai Mansingh Stadium in Jaipur. Andre Russell is the top six-hitter in T20 matches in 2019; he has hit 53 sixes in 21 innings this year. Probable Playing XI for KKR: Dinesh Karthik(c & wk), Chris Lynn, Sunil Narine, Robin Uthappa, Nitish Rana, Shubman Gill, Andre Russell, Piyush Chawla, Kuldeep Yadav, Harry Gurney, Prasidh Krishna.